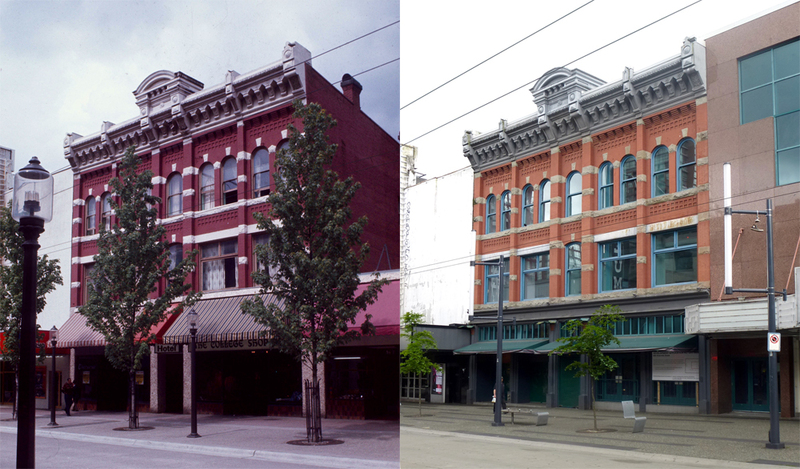 We have already seen John Vermilyea’s other building on Granville Street, built four years before this one. In 1893 William Blackmore designed this ornately detailed 3-storey building. We already noted that John Vermilyea was one of the earlier settlers in the area, arriving from Ontario in 1876 and running a farm in Richmond. His family could trace their origins back to Leyden in Holland, but Johannes Vermelje, a brewer, was married in New York City in 1670. J C Vermilyea died in 1913, the year that this building was converted to the Palms Hotel, with design work being carried out by F W Macey, an English architect who was living in Burnaby (and who lost everything that same year when his new house burned down while it was being built). F T Andrews was the owner (and he was living here in 1917), and Elsie Savan was the proprietor of the hotel operation for a couple of years (before apparently moving to Oregon, being replaced by Mrs M J Skinner). The hotel use continued through to the 1960s, when this image was taken, but in the 1980s the Palms was demolished, although the facade was restored and incorporated into the new Odeon Cinema. Now it’s about to become a stand alone building again, as the cinema has closed and will be restored as three separate buildings. The tallest buildings that were on the 100 block of Keefer Street in the 1960s are still there today. The three storey building next to an old frame dwelling was over 50 years old in the original picture and is now over 100 years old. It was built by the Sam Kee Company in 1912 designed by Kennerley Bryan, and built by R P Forshaw at a cost of $16,000. Initially it was given a permit as apartments/rooms. Sam Kee was essentially a fictional character, the merchant who ran the company was Chang Toy. Today the building houses office space, a change that occurred many years ago as Sam Kee were running their business from here in the 1950s. Further down the street and slightly older is the four storey $18,000 building built by the Vancouver Gas Co and designed by “Sharpe and Thompson” in 1910 (according to the permit – actually they were Sharp and Thompson). It was used as a warehouse in conjunction with the industrial gas plant built nearby, including storage of equipment. A few years ago it was extensively restored with an additional floor added on the roof. It now houses residential units, although they’re available as short-stay rental, and a new bar/restaurant called The Keefer. In between is a two storey building that was built at some point after 1912; (we haven’t been able to tell exactly when), and which replaced an earlier brick building designed in 1901 by T E Julian for Hip Tuck Lung Co, one of Chinatown’s legal opium processing companies. It was probably built as stables as by 1914 McFarland & Co, blacksmiths were at this location, and by 1920 two more blacksmiths, Alex Foulds and John MacRitchie were here. From the mid 1920s into the 1940s a horse dealer, Ernest Atkinson, used these premises. Beyond the Gas Company building Sam Kee and Kee Ling developed a $25,000 office/store designed by Vancouver’s only Chinese architect, W H Chow, in 1914. That’s probably the same building in the 1960s picture, although today the site sits vacant. The two biggest changes are the revision of the road system to the west (and the addition of street trees, which almost hide the buildings in spring and summer), and the replacement of the Keefer diversion and Marshall Wells warehouses with the Sun Yat Sen Garden, with the International Village residential towers behind. We’re got used to gas stations closing over the past few years, but it’s not a new phenomenon. This Standard gas bar was closed nearly 70 years ago. It was also not the first building on the site – in fact it wasn’t even the second. In 1912 the Avenue Theatre replaced two cottages on this site, but in 1935 this Standard Oil gas station was listed in the street directory. Standard Oil of Califonia entered the Canadian market in 1935 when Standard Oil Co. of British Columbia was launched in a two-room suite of the Hotel Vancouver. That same year the company expanded quickly by purchasing local oil distribution companies, acquiring service stations, establishing dealerships, starting a new refinery and acquiring a tanker, the B.C. Standard. Townley and Metheson designed several gas stations for the company in their first year, and this is listed as one of their projects, station #2. Like the theatre, the gas station didn’t last very long. By 1945 the BC Electric Company had acquired the site for a new sub-station that was named after the company’s President, W G Murrin. The power distributed from Murrin supplied the entire downtown area and for many years there was a smaller adjacent building that fed power to the city’s electric trolley buses. Remarkably, in a city that likes to reinvent itself (or at least its buildings) on a regular cycle, these single storey retail stores have sat on the corner of Robson and Burrard for over a century. They were built in 1911 by builders Allen & Jones at a cost of $9,500 for C N Davidson, and designed by Parr and Fee. A year later the same owner hired Braunton & Leibert to design a much more expensive proposition, the $132,000 stores and apartments called Irwinton Court, behind the stores. Those are still there today as well. 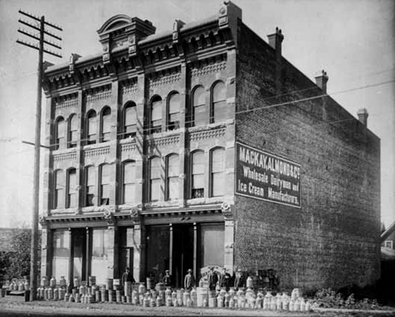 In 1890 jewellers Davidson Brothers had a store on Yates Street in Victoria, and another in Vancouver on Cordova, which had opened in 1888. 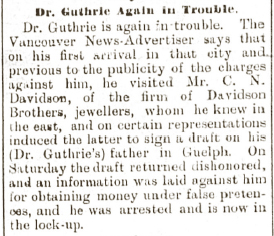 We know the brothers were previously in business ‘in the east’ because Dr Guthrie managed to borrow money (with insufficient funds to cover the loan) on the basis of earlier acquaintance. In 1894 the Provincial Building and Loan Association formed a local board in Vancouver, with C N Davidson as president. 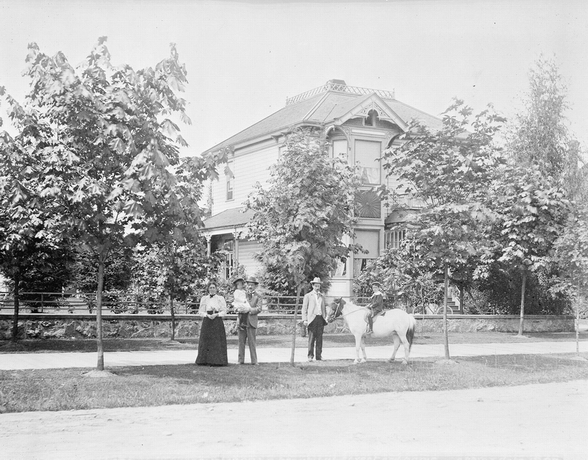 That year saw the family living at 731 Burrard, seen in this 1898 picture. In 1896 he was on the board of the Vancouver, Victoria and Eastern Railway along with William Templeton and other leading members of the Board of Trade. Unlike many of the proposed railways of the day, this one was actually built, and eventually became a subsidiary of the Great Northern. As we have seen with a number of other pioneer developers, Mr Davidson did not limit his interests to his main profession. In 1897 he was involved in gold mine prospecting. He and his brother, A A Davidson (who ran the Victoria jewellery store) were two of the four owners of a $250,000 mining company, Winchester Gold Mines of Fairview, Victoria, formed to purchase the Winchester claim in Yale. The same year they were also partners in the $250,000 Shamrock Mining Co with the intent of taking over the Shamrock claim in Osoyoos. Cicero was also briefly a defendant in a case against the Orphan Boy Gold Mining Company on McCulloch Creek where the owners (including C N Davidson) were accused of defrauding shareholders. While his brother seems to have maintained active involvement in the region, there’s no mention of Cicero retaining an interest. In 1899 Mr Davidson was severely hurt in a fall from a ladder at his home, but obviously recovered. In the 1901 census Cicero and Cecilia have a son Freeman, younger son Irwin N, her mother Fanny Haskell and their domestic Stella Struthers. In this census Cicero’s family background is Scotch, and his wife’s Irish. In 1911 the family were living at 779 Burrard (a renumbering of 731), Cicero and Cecilia were both aged 52, their sons Freeman and Norman (aged 18 and 14), his wife’s mother, Frances Haskett and their domestic, Rachel Cullen. The development of their home into the Irwinton Apartments must have taken place in 1913 – by 1914 all but one of the 54 suites is occupied. The family had moved to 1609 Harwood. Freeman appears to have fought in the First World War, but after that we have not been able to identify him. Cicero was living in retirement on Dunbar Street in 1926 (when this picture of his developments was taken), and was still living there in 1940. At this point his wife was Rose E Davidson; he remarried in 1922 after Cecilia had died. Rose was 24 years younger. Cicero Davidson died in 1946. In 1981 Irwinton Court was restored by architects Lort and Lort and strata titled. The East Hotel started life as the Hotel Reco in 1912. The architect was S B Birds, who it is fair to say is not known for his use of an abundance of decoration on the buildings he designed. The owner was Lee Kee, a Chinese merchant who headed the Lee Yuen (or Lee Yune) Company, one of the more affluent businesses in Chinatown, and the hotel was run by Mrs Margaret L Kennedy. Mrs Kennedy had previously run the Russell Rooms on East Pender and in 1911 was living there with her three sons and her sister, Lily Mathews who worked as a waitress in a hotel. The sisters were born in Ontario, as was her 18 year old son, Earle. Her middle son, John, was born in Alberta 15 years earlier, and her 12 year old, Cyril, was born in BC. The hotel was built almost exactly at the same time as the Hotel Stratford across the street. In the years before the hotel was built Lee Yune operated an opium factory on Market Alley, and were one of the two opium companies compensated for damages in the 1908 riot. (Their letterhead described their company as ‘Manufacturers of the Celebrated “E Y” Brand Opium). The company also imported and exported goods, and were involved in labour contracting. They were one of the four most successful businesses in Chinatown. Once McKenzie King successfully closed the opium manufacturing operation Lee Kee continued in business, including developing this $65,000 building. There were various businesses on the ground floor including the H Wong Agencies; the upper floors provided housing (as it still does today). Sing Sam ran a store in the building, hiring Braunton and Leibert to design the store in 1913, and in 1915 another permit for repairs said the owner was called O’Connor and Sam Sing was the tenant. In 1915 one of the building’s tenants was the Halibut Fisherman’s Union, and in the 1920s the same location was the home to the Chinese Methodist Kindergarten. In 1930 the Little Rose Confectionery store was run by Gow Gooey and Miss L Hong. In 1939 the name of the hotel changes to the Hotel East and Jack Matsui was manager. (Japanese businesses had been in the building for several years before this). In 1950 the name sequence had switched to East Hotel as it is today, and Chong N Low was in charge. Our 1972 picture shows the building is much as today – except today the street trees hide the building. This photograph was taken from the slope of Spruce Street (these days Choklit Park) looking across the yards of Vancouver Iron and Engineering Works some time in the 1960s. Through the 1920s and even earlier the Vancouver Machinery Depot Ltd were on this site; in 1928 the Vancouver Iron Works also appeared in the street Directory. The company expanded on the shore of False Creek, becoming the biggest machine shop west of Toronto and north of San Francisco. Vancouver Iron and Engineering Works built equipment from propane tanks to logging equipment, and from stainless steel valves for the pulp & paper, chemical & petroleum industries to railcars for carrying woodchips. In 1966 the company was bought by a US financier, and it looked as if it had a solid future – in 1968 an order was placed for six girders, each 190 feet long and weighing 110 tons for an Alaskan natural gas refinery worth $500,000. 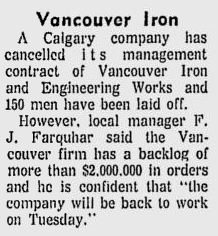 The company didn’t last much longer after that, and the entire South False Creek and Fairview area were transformed into a modest density neighbourhood (by Vancouver standards, and given the proximity to Downtown). The housing on the left is Fairview Place that was built in 1983 to Rhone and Iredale’s designs. The building on the left hand side of this picture is the end of the Templeton Block that we already featured here. Two doors to the east is the 5-storey Dodson Hotel. Unusually the building was indeed built by Mr Dodson and his name is still associated with it. Joseph Dodson arrived in Vancouver around 1889 and he was listed as a labourer in 1890, living on Powell Street. A year later he appears on the 1891 Census as a butcher, aged 47 with his wife, Jane and their four children including 18 year old Mary Jane, and Joseph who was 13. Joseph and Jane had lived in Barrow in Furness in Lancashire – that’s where Mary Jane was christened and where they were in the 1881 English Census. The 1911 Census suggests Mary Jane had arrived in 1891, so her father may have been getting established before the rest of the family arrived. By 1894 Joseph had set up the Old England Bakery at 17-19 East Hastings – the same location that he later built the hotel and bakery we can see in this 1978 picture (and that’s still there today). In 1903 he had some work carried out to an earlier bakery on the site designed by T E Julian. In the 1901 Census all four children were still living at home. The new bakery and rooming house was designed by Sharp & Thompson in 1909 costing $55,000. Dodson opened a new bakery in the new building and a couple of years later George Peters was running the Dodson Rooms upstairs. In 1909 August Kolle appears as a baker at the Dodson Bakery, joining both Joseph Dodson senior and junior – one a baker and the other a pastry chef at the bakery. It looks as if at least one of Joseph’s other sons, Robert, was a clerk in the business. In 1910 Joseph senior had retired and Joseph and August are joint proprietors in the business. August had American citizenship but was born in Germany, arriving in Canada in 1899 (according to the 1911 Census). We don’t know exactly when – but August Kolle married Mary Jane Dodson some time before 1905. In 1911 they have three children, Robert, Mary and Wilhelm (August’s middle name). There’s no sign of them in the city before the 1909 Street Directory, and their two older children were born in the US in 1905 and 1906, so presumably that’s where Mary and August were living before returning to join her father. Next door, the smaller two-storey building between the Templeton and the Dodson with the intact cornice was built in 1914. The permit refers to Mrs Cole Dawson, who had the Gray Brothers design the $11,000 project built by D G Gray. Mrs Cole Dawson had the Grey brothers repair a house in 1902, carried out repairs to the house that preceded the new Dodson Hotel in 1903 and Mrs C Dawson carried out repairs to a Main Street house in 1911. We’re not at all sure who Mrs Cole Dawson is. There’s nobody of that name in the city directories or any census. Logically it’s a misprint for Kolle Dodson – and indeed, the family used the anglicised spelling of Cole for a while during the sensitive period leading up to World War One. Throughout 1913 there are newspaper references to a 6 storey building to be built by Mrs Cole Dawson on East Hastings, designed by J Dawson. John Dawson was an architect who seems to have had partnerships with two different partners, as Campbell and Dawson from 1910 to 1916 and with William Pentecost around 1911 and 1912. (Campbell and Dawson designed the Cobalt Hotel in 1913). We’re pretty certain that biographical references that suggest he’s John Wilding Dawson, who designed the City Market in 1891 are wrong. That’s because John Wilding Dawson left Canada for Mauritius and died there in 1914. We think he was more likely to be the same John Dawson who was a contractor in 1910. it’s likely that the plans for the 6 storey building never materialised as the economy went into a nosedive and the more modest Grey Brothers building was built instead. We know Joseph Dodson died in his 80s in 1928, five years after his wife. August Kolle died in 1941, and Mary a year later. Today the Dodson is a privately owned Single Room Occupancy residence. Owned by The Dodson Foundation, the Community Builders Group operate the building. Dodson tenants, staff and volunteers have adopted a Whole Life Housing approach to wellness which features: affordable rent; assistance with addictions and medical issues; a breakfast and community kitchen program; housekeeping services; employment services; free laundry; and, an advanced pest control and room maintenance program.